"Bosnia and Herzegovina . . . good manpower, good clients, good results. BiH has very favourable geographical position – being on the cross road between the West and the East, Mediterranean and the Continent, two hours flight distance from business centres. Companies in BiH have rich tradition of successful participation in international projects worldwide (before the war, some of companies from BiH were leading world companies in their spheres). BiH has highly qualified and motivated workforce, with good knowledge of foreign languages. BiH has stable currency linked to EURO. Inflation rate per annum in BiH does not exceed 3%. 95% of products from BiH is exempted from all taxes during import in the countries of EU. BiH enjoys trade preferential when exporting its goods in certain number of other countries. In terms of the rights, foreign investors are equalled to local ones. Rights of foreign investors in BiH are specially protected. BiH has up to date telecommunication network. BiH is important power producer and exporter in the region. Sarajevo is becoming one of the most important congress as well as winter centers in the South Eastern Europe. Welcome, To the Heart-Shaped Land, the land of your business opportunities! Open economy of Bosnia and Herzegovina and its readiness to partake in international business cooperation represent a great challenge for businessmen from all over the world. 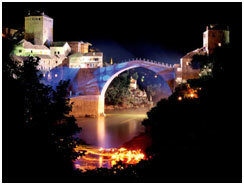 In Bosnia and Herzegovina you will find fully accepted modern business culture. In the past decade, the business community has, owing to the presence of various international agencies, foreign investors, and programs for technical support, adopted principles of modern business practices. With your business partners from Bosnia and Herzegovina you will communicate professionally, with modern electronic technology. Main motive for your business visit to Bosnia and Herzegovina should be high-quality and highly educated work force, low business expenses, good connections with regional markets, as well as Bosnian natural scenery, cultural and historic monuments, and people with open heart. Bosnia and Herzegovina is exceptionally beautiful country where visitor encounters various fascinating sites, cultures and traditions. It is a place where the east and west civilization meet with its respective peculiarities that have became a part of Bosnian opulent and versatile mosaic. This makes Bosnia and Herzegovina an ideal destination for your business trip, organization of your conference or participation in one of our numerous fairs. In order to make your business visit to Bosnia and Herzegovina comfortable, useful and pleasant, we created the this web site which purpose is to unify elementary information on how to get prepared, what to expect and how to spend your time efficiently.